Join over 9,000 families today! Banish naptime battles and regain control of your day and sanity…starting right now! When I was a new mom with a new baby just a few short years ago, I thought my son would do what the babies of practically all my friends seemed to do so easily – sleep like a baby. Yeah, right! Not my baby. No matter what I did or didn’t do, he just wouldn’t nap. Or when he did nap, it took forever for me to get him down — and his sleep was still short and fitful. I was at the end of my rope – overwhelmed, exhausted, and in desperate need of some daytime downtime – a date with just me, myself, and I. No more guesswork, no more guilt. You CAN get rid of that naptime knot in your gut and start enjoying your baby again – today! Day after day, I dreaded the naptime struggle. Day after day, I always felt like every motherly instinct I had was all wrong. I mean, if he wasn’t sleeping during the day, shouldn’t he naturally just make up that missed sleep at night? It took me countless hours of research before I finally got it – daytime naps and nighttime sleep are as different as, well, night and day. I also discovered that the strategies that work to get babies to sleep at night rarely work to establish a consistent napping schedule during the day. And when children have the solid daytime rest their bodies need, they actually sleep longer and better at night. Nap success is just a click away – I personally guarantee you a baby who sleeps better — or your money back! I’m willing to bet that if you’re reading this, your baby or toddler isn’t exactly sleeping like a baby, either. But you don’t have to suffer like I did. I promise you, there is relief at hand, and you can start getting it today! 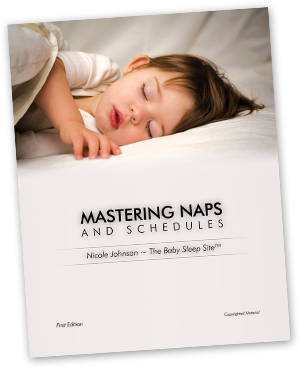 In my e-book Mastering Naps & Schedules, I give you a complete toolkit of tips, advice, sample schedules, and sleep logs to get your baby to love naptime – so you can get back in control and really start enjoying your baby. Download our Mastering Naps & Schedules Gold Package NOW and GET 6 FREE BONUSES! It takes just a few minutes to start getting back those precious, head-clearing hours in your day! 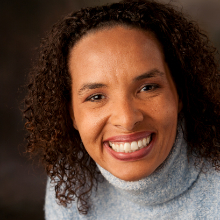 My name is Nicole Johnson, and I am a married mother of two wonderful boys, and Baby Sleep Coach and Owner of The Baby Sleep Site®. Driven by my own frustration with a baby who napped badly, if at all, I began to research the key literature and scientific reports on how babies nap. It’s what I learned from my months of research that I now share as an expert in sleep methods, scheduling routines, baby development needs and more. How much sleep does my baby really need to be healthy – from newborn to toddler and beyond? Should I let my baby cry-it-out or not – and how will it affect our relationship? How can I get longer naps for my baby and more time for myself? Which sleep coaching method is the best match for my baby and my parenting style? Why are naps so important for nighttime sleep? How do I break my baby’s dependence on me to fall asleep? When’s the right time to cut out a nap? What’s the best way to transition from co-sleeping to a crib? Detailed, easy-to-follow schedules for naps, meals, and nights – choose from 5 sample schedules for each age, from 4 months through the toddler years – that’s an incredible 40+ total sample schedules to customize and plan your day the easy way! Optional Express Sleep Plan® – receive a customized plan specific to your family’s history, your family’s philosophies, and your specific goals. The Express Sleep Plan® includes direction, a recommended sleep coaching method based on your philosophy, and a day-by-day action plan that is customized for you and your family – all in one, brief easy-to-read, budget-friendly package! Please note that the Express Sleep Plan® is suitable for babies who are 4 months of age and older, and who are in good overall health. If your baby is younger than 4 months, or has health/developmental problems that you feel are complicating your sleep issues, we recommend you consider a personalized sleep consultation with an expert consultant. No matter what your child’s temperament or age … whether you’re stay-at-home, working full-time or part-time, or employing a nanny or daycare – I’ve designed the techniques in Mastering Naps & Schedules to be customizable and flexible, so they will work for your family – or you get your money back. That’s right – if you are not fully satisfied with your purchase, you can request a full refund within 30 days of your purchase date. Join over 9,000 families and banish the naptime beast forever! Grab your e-book via instant download now! Napping baby. Rested parents. Priceless. time to figure out and make up a new schedule every month as your baby ages. That is an estimated 48 hours or more of your time. If you paid yourself even just $8 per hour, that is $384 plus the cost of the books (over $400 total!). Not only will this e-Book save you time and money, it will give you the tools you need to help your baby nap better and longer, and you can’t put a price on that. Mastering Naps & Schedules has done the work for you, so you can put your focus back on other things with your baby other than sleep! As any mom who’s been there knows, getting the rest you both need is more precious than gold. I got my control back and you can, too. Just pick the Napping Success package that works for you. P.S. You don’t need to stress, cry or clench your teeth over naps any more. Download Mastering Naps & Schedules today, and in no time at all, both you and your baby will be getting the healthy break and quiet time you need. Remember, your satisfaction is fully guaranteed! You have nothing to lose (except for those nasty naptime tears and fears – and who wouldn’t be glad to be done with those)! Give your baby the best gift in the world – a happy, confident and rested mommy. Order your e-book today!